When it started back in the early 2000's Naruto was seen by many at the heir apparent to Dragon Ball Z's crown. Following the adventures of a young shinobi on the quest to be the best ninja around, it seemed to have a lot of cross-over potential. However, while it did develop a strong fanbase- along with One Piece and Bleach, it makes up the “Big 3” of current series- it never quite managed that DBZ level of mainstream acceptance. Naruto Shippuden is to Naruto what Dragon Ball Z is to the original Dragon Ball, a sequel series following the titular ninja and his cohorts after a timeskip. 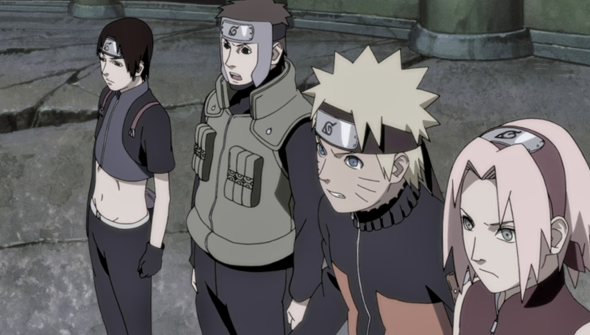 The Lost Tower is the fourth theatrical spin-off from the Shippuden series. There's a long tradition of these feature-length outings based on long-running anime. They haven't always had the best reputation as they are creatively limited by the need not to affect the ongoing continuity of the series they spun off from. For example, nothing major is going to happen to any of the characters and no events can occur that would permanently affect the overall plot. They need to be deliberately designed so they can slot anywhere into the timeline (after a certain point). The result can be movies that lack tension or any real stakes. One of the ways that the writers can get around some of these problems is by putting the characters in an unusual situation or by introducing new characters specific to the movie. In the case of The Last Tower, they chose to do both. During a mission to capture a rogue shinobi in a ruined city, Naruto Uzumaki finds himself thrown back in time. Twenty years earlier the city was fully functional, and ruled over by a young and plucky queen. There Naruto encounters some strangely familiar figures- ninjas from his own village of 20 years ago. They uncover a plot to overthrow the young queen- a plan the could put in jeopardy not just the people of the city, but also the future itself. The time travel plot device not only takes Naruto out of his comfort zone and into a whole new world of danger but also adds a neat twist. Seeing him teaming up with the Leaf Village Ninjas of the past is truly something we've never had the chance to see before. Better still, it allows him to fight alongside a certain key figure from his past, giving the whole tale an extra layer of emotional resonance. The new characters are well designed and likeable (or hateable in some cases). Queen Sara is a particularly engaging figure, a strong-willed and feisty heroine it's easy to get behind. It's just as well the new characters work as well as they do, as you spend most of the movie with them. Aside from the orange jump-suit sporting Naruto himself, the main cast are practically reduced to cameos, which may annoy some viewers. On TV Naruto Shippuden is a series that for the most part looks very good. The animation gets a slight upgrade for the big screen, if nothing that will make your jaw drop. It's nowhere near the quality of top-end theatrical anime in the Ghibli or Oshii mould, but you're unlikely to be left disappointed. Naruto's stock and trade is in spectacular action set-pieces, and the Lost Tower certainly does not disappoint. The villain of the piece, Mukade, uses his powers to control puppets, giving the battles here an original twist. You also get to see Naruto teaming up with his Leaf-Village predecessors to take the bad guy on, resulting in some pretty phenomenal action. These Shonen movie spin-offs may be by their very nature inessential, but The Last Tower is up there with the best. With a compelling story, polished visuals and the quality ninja action you expect from Naruto, this is a disc that any fan would be pleased to add to their collection.